Four mornings 10-12, in a shopping complex, in the second week of the Victorian September school holidays – how would an International Year of Soil Science activity go? I wasn’t sure how difficult it was going to be create soil activities for a shopping complex instead of a school room or an ag show. It turned out to be fine and very enjoyable, engaging with young people in family groups, that kept me busy most of the time. 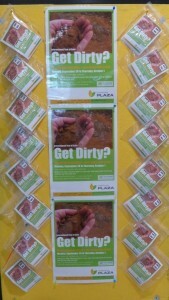 So it was a wonderful way to be raising awareness of soils for the International Year of Soils 2015 in the wider community. I loved the relaxed interactions with mainly family groups – (grand) parents and their children – and helping them explore soils. The morning time slot turned out to be a good choice as there were not too many people around at a time for me to work with on the experiments, while the displays could be looked at by those who had less time to spend and could have had discussion but did not have to. I adapted my Snooping into Soils activities (from my schools National Science Week program) so there would only be reactions left to do in about a 1/4 hour, for those who had time to explore and do some practical science. The aim to have people bring in their own soils for exploring was not successful as only a couple were brought in by return visitors. 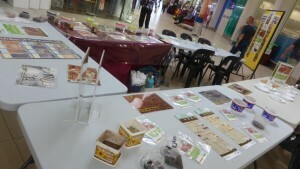 Instead I had prepared some bags with different soil types and most participants chose from these. Colour turned out the main aspect of choice, and as siblings mostly did not want the same, they saw different reactions. What did they take away? All learnt simple methods to take home to explore their own soils – and one longer running experiment, and a handout in support of this. 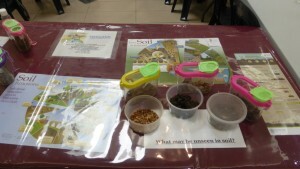 They also chose flower or vegetable seeds to plant to help them come closer to soil in the future. How far did this soil experience and knowledge spread? Just over half the families who did the testing came from Horsham, over a third came from the region ( Haven, Murtoa, Dimboola and Rainbow) and the remainder from rural Victoria (Lara, Swan HIll and Ballarat) . Most of the children were of primary school age with about 1/10th pre-schoolers. .. I didn’t ask parents and grandparents for their ages! I didn’t survey those who were not doing the experiments. The test activities were new to all who participated – except a couple who had done pH with their pools. (Close – up) Children were surprised at the detail they saw when looking at soil under a magnifying glass. What happens when you add a drop or more of water to soil? In Water Love children were excited to see non-wetting sands that refuse to let the water in and might run water drops off, or gather a coat of tiny grains on top of them. Some cloddy clay soils bubbled delightfully. The sands let water in so quickly that they instantly became ‘dirty’ showing they had some clay content too. it was great to have side-by-side comparisons with siblings. The Soil Shakes were of course fun and we were careful not to make a mess! (Basic idea: mix soil into water, watch what happens, shake, then let gravity do its work -watch over time.) They were taken home to reverse the mixing and create a tub of soil layered by its textures – with the aid of evaporation. So with this, seeds and record/information sheet, ie SnoopingIntoSoilsRecordSheetBase , the IYSoils went into homes. Do you know any good soil jokes? They are a bit thin on the ground! (Mine) especially if suitable and understandable by children. I had written a couple for children on the info sheet, but discovered a disconnect with most of the children and their natural environment when I used them. Grandparents, and some parents, got them and explained them to the children. 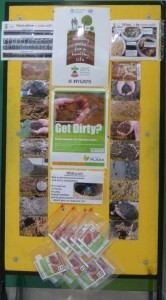 For those who did not want or have much time to stop and do the testing, I added: display materials with photos, a range of soil type samples (photo left), IYS info posters, the Odd One Out challenge and live soil creatures (photo above) under magnifiers for those who would like to look at something in a couple of minutes. While I was running the science explorations, there were people looking independently at these soil resources so I felt they were worth the effort, even if I did not have a discussion with them. 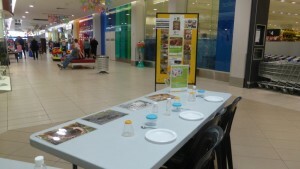 Thank you to Allison and Retpro administration for their willingness to see how active Science experiments with soils might go in their Horsham Plaza shopping complex and to fund it, so that it was offered for free to the community, and put Horsham on the global calendar of International Year of Soils events ... and maybe we can do it again somewhere sometime…. 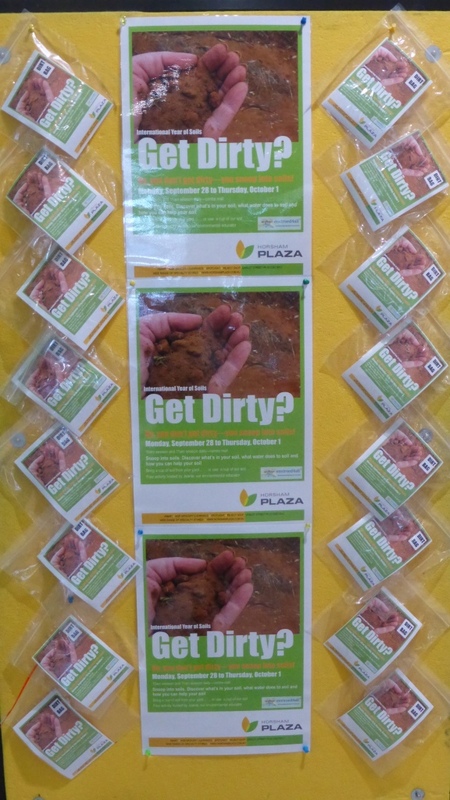 May 2016 PIEFA Food and Farming Matters conference – quick sharing of many of the Snooping into Soils activities as a workshop with mostly teacher attendees as PD. 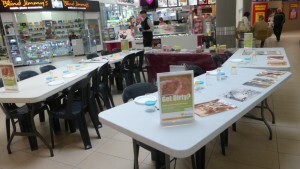 May 2016 Soil Close-up and Soil Shakes shared with a group of 70-80 yo seniors in Horsham – who loved it. As a freelance environmental educator, my work in creating these Snooping into Soils activities, record sheet, most community events and this website is UNFUNDED.